Part of the beauty of a home office is that you are in full control. Gone are the cubicles, water coolers and seas of file cabinets. This room can truly be anything you desire. 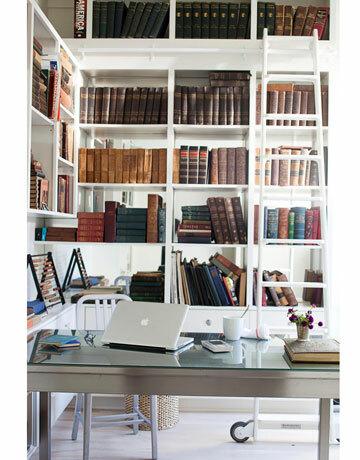 So, with incredible ideas for home office organization like these, beautifully organized can be at the top of that list. The desk. The chair. The lamp. They’re all home-office essentials.However, why settle for just those when you can't turn your space into the ultimate organizational masterpiece? Whether you choose one, two, or the whole slew, learn how to organize your home office with these 10 great ideas. Considering how much time you’ll spend in your home office, it’s ideal you invest in furniture you actually like. But remember to keep it simple. Don’t buy so many things that you clutter your space before the work even begins. In this case, less is truly more. 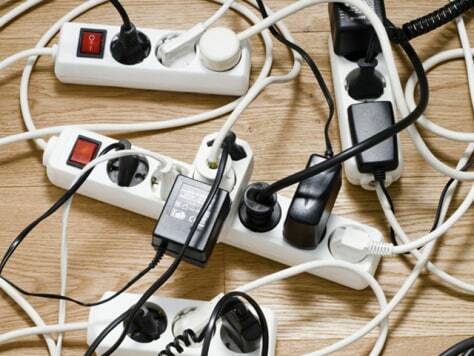 Nobody likes bundles of unsightly cords tucked into every nook and cranny. Ditch your desktop and use a laptop as a your primary computer. Wireless printers are also getting more and more affordable and you can easily find one at your favorite local electronics store. It may not seem like much, but trust us, this simple change can lead to a dramatic difference in the way your home office looks and feels. Cut your cords. Cut your clutter. 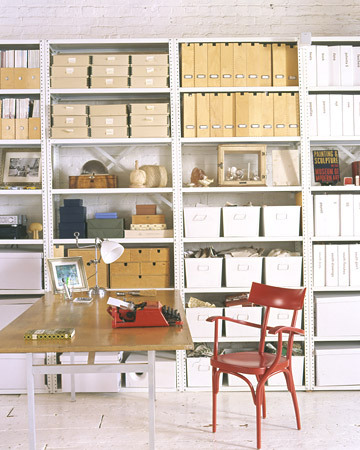 Organizing your home office is a breeze with simple floor-to-ceiling shelving. Screwed into the wall for stability, these shelves not only add tons of space for books, bins, and other organizational ideas, but décor as well. You can even add a sleek, sliding ladder for extra flair and functionality. If a clean, simple, stress-free look is important to you, this one’s hard to beat. 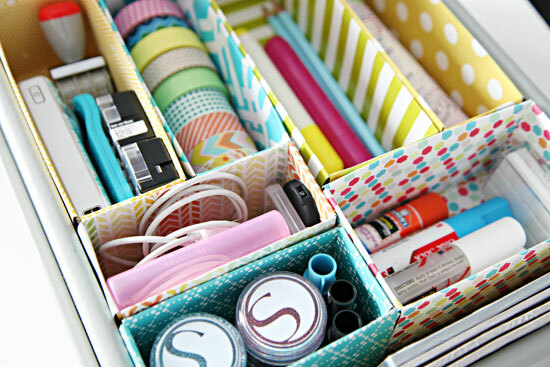 Tired of all your pens, paperclips, scissors and so on sloshing around inside your drawers? Sort each by category with simple drawer dividers. And if you feel like making your own, cereal boxes wrapped in shelf liner or wrapping paper are the perfect place to start. You can cut them to any size you need, and it’s always easy to add more whenever the need arises. When it comes to marrying home office organization with style, nothing does it better than the bin. With nearly endless styles and colors to choose from, it’s easy to personalize the look while keeping yourself tidy. Plus, labeling your bins can help you know where you put, or at least where you were supposed to put, any item you’re after. Feel free to mix and match your bins for an extra dose of style. If you absolutely have to have an old, funky looking file cabinet, you might as well make it funky in a good way. Try turning an old chest or trunk into a file cabinet. If the standard dividers are too small to sit firmly on their own, measure the distance and have a few small pieces of wood cut to size at your local hardware store or lumber depot. 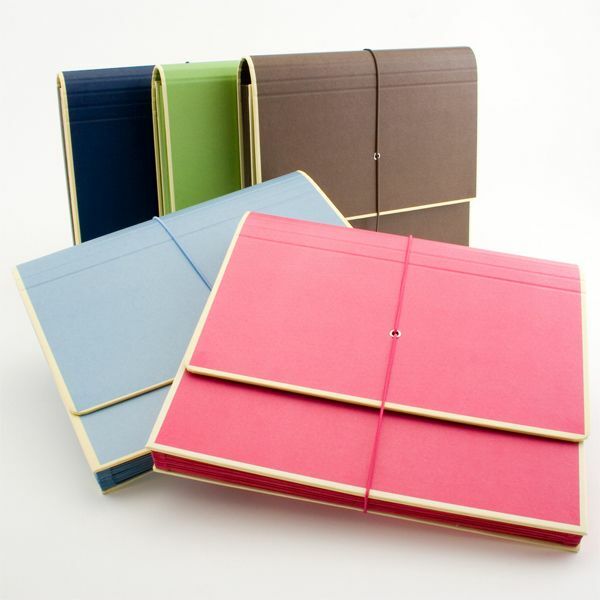 After gluing them in, hang up your folders and relish in the coolest file cabinet on your side of the Mississippi. Love getting crafty? Then you’re sure to love the flexibility cork boards and pegboards make possible. Not only can you customize their layout, but also their size and color. It’s a quick and easy way to add spice and personalization to nearly any workspace. Objects aren’t the only things that need organization. What better way to keep track of your dates than with a good old-fashioned calendar? Choose a traditional wall or desk calendar, or opt for a dry-erase version to cut down on even more clutter. This innovation has proven itself in the kitchen, but it’s got a few more tricks up its non-existent sleeve. Out in the open or out of sight, a magnetic knife rack is perfect for stashing your keys, notes and other random knickknacks. Try hanging it on the inside wall of your desk, on top of your desktop, or even beside the doorpost. Of course, besides being utilitarian, it can double as a display piece for your magnificent magnet collection. Want to clean up the daily paper clutter? Start yourself a “Waiting on Response” folder. A WOR folder can help keep your desk clear of projects that aren’t as pressing without having to file each away separately. Every few days, take a peek inside the file to see if there’s anything you need to follow up on. With home office organization ideas like these, you might just love your home office so much you don’t ever want to leave. Luckily for you, you won’t have to. That too is the beauty of having a home office.